Attentive and a role mode for others, fifth-grader Taylor Ferris was named the Rotary Club of El Dorado Hills' Student of the Month. 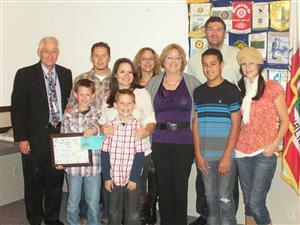 "He's always caring, considerate," said Jackson Elementary School teacher Pam Banks of the Rotary Club of El Dorado Hills' Student of the Month, Taylor Ferris. Banks said she wished all her students paid as close attention as Taylor. "He's just one of those kids who works really hard." Principal Michele Miller called the 11-year-old "calm, cool and collected" and she commended Taylor for always volunteering to clean up after recess and reach out to other students. Taylor received a plaque and savings bond presented by Rotary Club President Jeff England.